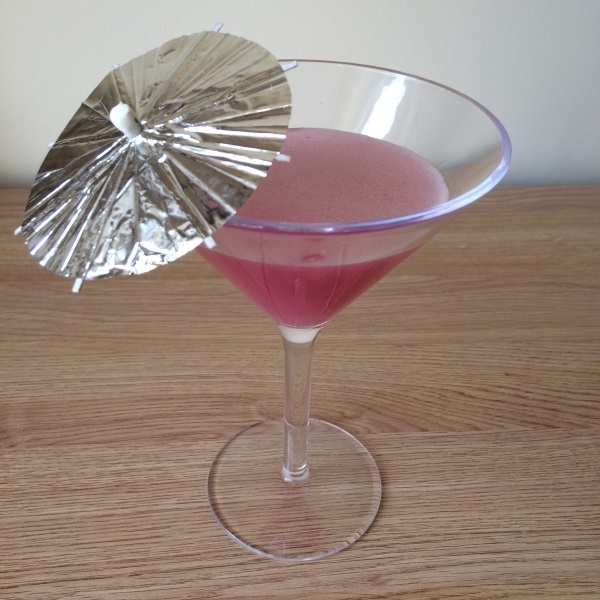 "It's a refreshing and tasty blend where you can actually taste raspberry and kiwi!" 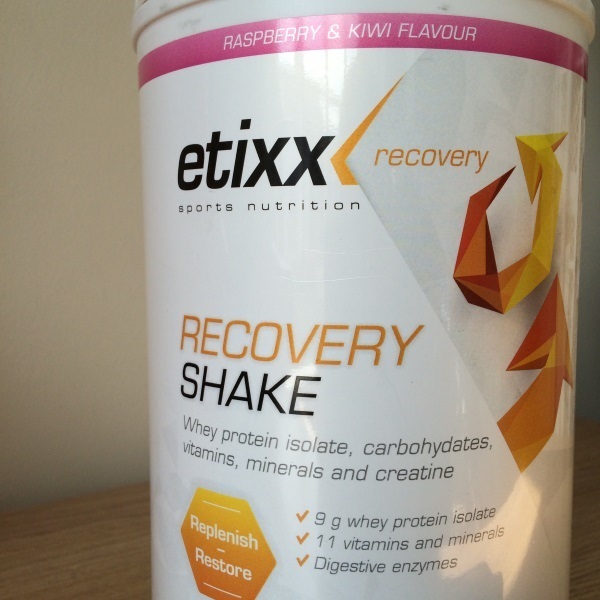 I'm firmly of the opinion that recovery shakes are important to get right, with them being the thing that accompanies that 'aaahh' feeling after a ride or race. Having chowed down on bars, necked gels and potentially stopped for tea and cake, actually wanting to pour another half litre of something down your throat when you get in is a big ask. Now obviously getting it right is something that every product developer and boardroom table wants to do, but actually doing it is another matter. For me a recovery shake should feel like a reward and be fully OK to take into the shower while you wash away the miles. It should also be easy to mix and polish off, not requiring the sort of grit and endurance that it takes to get through a big ride in the first place. To fill you in, this is a whey protein-based recovery shake that goes the extra mile in giving you carbohydrates, vitamins, minerals and energy-providing creatine. 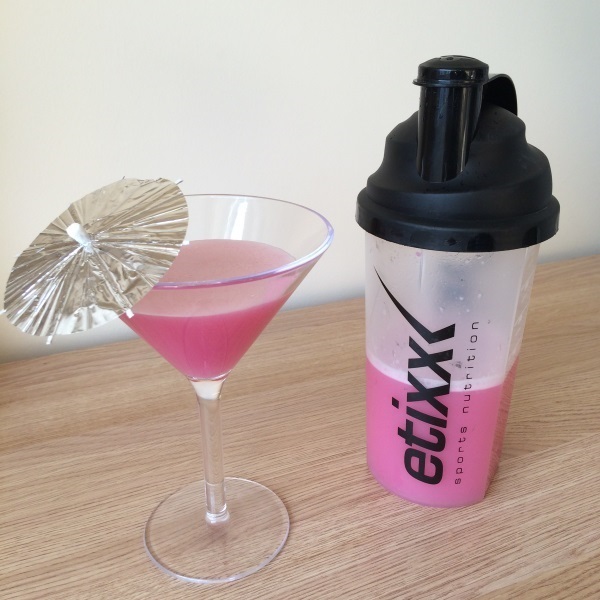 Unlike similar products I've tried, Etixx recommend two different ways of taking it on. For 'maintenance' workouts it's 50g (three scoops) to 500ml, where for an 'intensive' session you double the powder quantity to 100g. I've actually not tried this bumper option as it feels a bit much; perhaps reserved for something like a Marmotte or 50 mile TT. 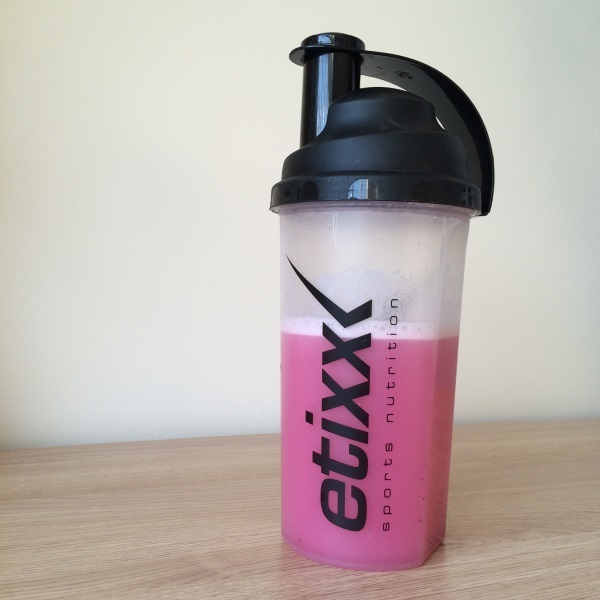 I'd previously opted for the more chocolate-y end of the spectrum in the hope that it would be a little different from the fruity gels and electrolyte tabs I tend to use, so finding out that this offering from Etixx was raspberry and kiwi flavour left me feeling a little unsure. Breaking through the seal for the first time the candy floss sweet smell was awesome, but a bit sickly. Mixing up a bottle of this pink drink, the powder disappears pretty darn quickly and you're left with a really nice consistency. One bonus I've noticed whey protein has over others is that the liquid feels a lot thinner and is therefore easier to drink. That's definitely the case with this one, where it doesn't feel at all grainy or gloopy. If you're a fan of milkshakes this should be right up your street too, where it's absolutely fine to opt for the white stuff instead. Another positive on the consistency front is that the drink pretty much stays mixed and you don't get that powdery last inch or so that makes you pull a face as you drink it. With all of the vitamin-y, mineral-y bits listed in the ingredients I was expecting a sort of primordial soup to greet me towards the end, but there was nothing of the sort. Also makes it easier to clean your shaker when you're all done. And then the taste is really quite nice - and not half as sweet as I had imagined. Instead, it's a refreshing and tasty blend where you can actually taste raspberry and kiwi. This seems like something you might find in a J2O bottle (other fruity blend drinks are available) or some organic, independent producer's offering with a fancy label, plus on a hot day I'd definitely throw a few ice cubes in if some were nearby. Not bad at all that it's doing you lots of good at the same time, then! 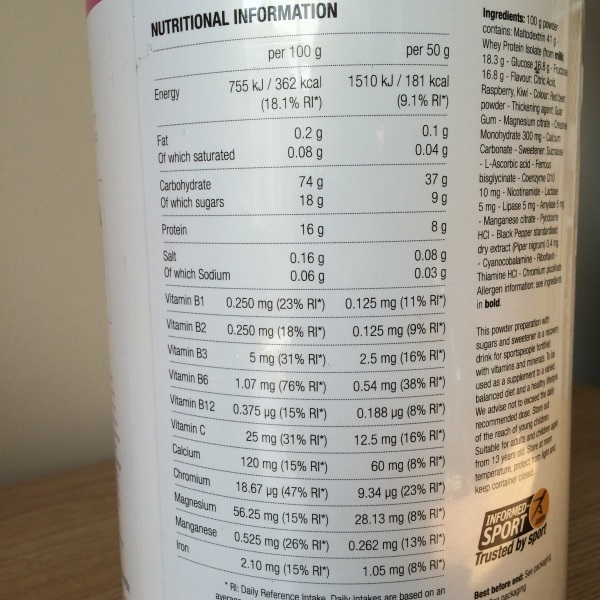 Something to highlight is that this product actually boasts a big helping of carbohydrates at 37g per 50g, while some whey shakes pretty much leave this out with the presumption that it won't be long until you sit down for a proper meal. The protein content on top of this is actually a relatively low 8g per 50g, though it's in the form of high quality whey isolate delivering pure protein for speedy recovery. Best taken immediately after exercise, the carbohydrate punch (in both senses of the word) starts off by replacing lost glycogen stores in your muscles and liver while the super protein begins to look after the recovery side of things. Vitamin B6 does a sort of foreman's job and oversees all of this, making sure it's done efficiently, while an 8% serving of your RDI of vitamin B12 helps with energy production. It's difficult to rate the actual recovery attributes, as I've always woken up the day after a big ride and protein shake feeling better than if I'd just had a cup of tea or launched straight into dinner. I'm afraid mine wasn't a clinical trial, but I can attest to the drink's restorative powers - particularly when I took it over to Mallorca for a nine-day training camp and didn't hear any major grumbles from my legs. For me this is a product that I'd like to keep alongside another of a different flavour - and perhaps one with a protein to carbohydrate ratio that tips a little more heavily in favour of the protein. It's a pretty special way to end a summer ride as it genuinely feels as though it deserves to be in a cocktail glass, but it would be good to see a bit more variety. <a href=https://vk.com/casinororg>Ð˜Ð³Ñ€Ð°Ñ‚ÑŒ Ð² Ð»ÑƒÑ‡ÑˆÐ¸Ðµ online casino</a> Ð²Ñ‹ Ð¼Ð¾Ð¶ÐµÑ‚Ðµ ÐºÐ°Ðº Ð² demo Ð²ÐµÑ€Ñ�Ð¸Ð¸, Ñ‚Ð°Ðº Ð¸ Ð½Ð° Ð½Ð°Ñ�Ñ‚Ð¾Ñ�Ñ‰Ð¸Ðµ Ð´ÐµÐ½ÐµÐ¶Ð½Ñ‹Ðµ Ñ�Ñ€ÐµÐ´Ñ�Ñ‚Ð²Ð°. Ð'Ð°Ð¶Ð½Ð¾ Ð²Ñ‹Ð´ÐµÐ»Ð¸Ñ‚ÑŒ Ð¸Ð³Ñ€Ñƒ Ð² Ð¾Ð½Ð»Ð°Ð¹Ð½ casino Ð½Ð° Ð´ÐµÐ½ÑŒÐ³Ð¸, Ð³Ð´Ðµ Ð²Ñ‹ Ð¼Ð¾Ð¶ÐµÑ‚Ðµ Ð¿Ð¾Ð»ÑƒÑ‡Ð°Ñ‚ÑŒ Ð¾Ñ‚Ð»Ð¸Ñ‡Ð½Ñ‹Ðµ Ð±Ð¾Ð½ÑƒÑ�Ñ‹. ÐœÐ½Ð¾Ð¶ÐµÑ�Ñ‚Ð²Ð¾ Ð¾Ð½Ð»Ð°Ð¹Ð½ ÐºÐ°Ð·Ð¸Ð½Ð¾, ÐºÐ¾Ñ‚Ð¾Ñ€Ñ‹Ðµ Ð²ÐµÐ´ÑƒÑ‚ Ñ�ÐµÐ±Ñ� Ñ‡ÐµÑ�Ñ‚Ð½Ð¾, Ð¿Ñ€ÐµÐ´Ð¾Ñ�Ñ‚Ð°Ð²Ð»Ñ�ÑŽÑ‚ Ð±ÐµÐ·Ð´ÐµÐ¿Ð¾Ð·Ð¸Ñ‚Ð½Ñ‹Ðµ Ð±Ð¾Ð½ÑƒÑ�Ñ‹. Ð£ Ð¼Ð½Ð¾Ð³Ð¸Ñ... Ñ�ÐµÑ€Ð²Ð¸Ñ�Ð¾Ð² Ñ€ÐµÐ¿ÑƒÑ‚Ð°Ñ†Ð¸Ñ� Ð¾Ñ†ÐµÐ½Ð¸Ð²Ð°ÐµÑ‚Ñ�Ñ� Ð»Ð¸Ñ†Ð°Ð¼Ð¸, ÐºÐ¾Ñ‚Ð¾Ñ€Ñ‹Ðµ Ñ‚Ð°Ð¼ Ð¸Ð³Ñ€Ð°ÑŽÑ‚. Ð*Ñ�Ð»Ð¸ Ð¸Ð³Ñ€Ð¾ÐºÐ¸ Ñ� Ð¸Ð¼ÐµÐ½ÐµÐ¼ Ð¸Ð³Ñ€Ð°ÑŽÑ‚ Ð½Ð° Ð¾Ñ„Ð¸Ð³ÐµÐ½Ð½Ñ‹Ñ... Ñ€ÐµÑ�ÑƒÑ€Ñ�Ð°Ñ..., Ñ‚Ð°ÐºÐ¸Ðµ Ð¿Ð¾Ñ€Ñ‚Ð°Ð»Ñ‹ Ð¾Ð±Ð»Ð°Ð´Ð°ÑŽÑ‚ Ð»Ð¸Ñ†ÐµÐ½Ð·Ð¸ÐµÐ¹. ÐšÐ°Ðº Ð¿Ñ€Ð°Ð²Ð¸Ð»Ð¾, Ñ‚Ð°Ð¼ Ñ€ÐµÐ°Ð»ÑŒÐ½Ð¾ <a href=https://www.facebook.com/groups/casinor.net/>Ð¸Ð³Ñ€Ð°Ñ‚ÑŒ Ð² Ð¸Ð³Ñ€Ð°Ð»ÑŒÐ½Ñ‹Ðµ Ð°Ð²Ñ‚Ð¾Ð¼Ð°Ñ‚Ñ‹ Ð½Ð° Ð´ÐµÐ½ÑŒÐ³Ð¸</a>. Ð*Ñ�Ð»Ð¸ Ð²Ñ‹ Ñ...Ð¾Ñ‚Ð¸Ñ‚Ðµ Ð½Ð° Ð¿Ð¾Ñ�Ñ‚Ð¾Ñ�Ð½Ð½Ð¾Ð¹ Ð¾Ñ�Ð½Ð¾Ð²Ðµ Ð²Ñ‹Ð¸Ð³Ñ€Ñ‹Ð²Ð°Ñ‚ÑŒ Ð¾Ð³Ñ€Ð¾Ð¼Ð½Ñ‹Ðµ Ð´ÐµÐ½ÑŒÐ³Ð¸, Ð²Ð°Ð¼ Ð¿Ð¾Ñ‚Ñ€ÐµÐ±ÑƒÐµÑ‚Ñ�Ñ� Ð¿Ð¾Ñ�Ñ‚Ð¾Ñ�Ð½Ð½Ñ‹Ð¹ Ð´Ð¾Ñ...Ð¾Ð´. ÐŸÐµÑ€Ð²Ð¾Ðµ Ð²Ñ€ÐµÐ¼Ñ� Ð½Ðµ Ð¿Ð¾Ð»ÑƒÑ‡Ð¸Ñ‚Ñ�Ñ� Ð²Ñ‹Ð¸Ð³Ñ€Ñ‹Ð²Ð°Ñ‚ÑŒ Ð±Ð¾Ð»ÑŒÑˆÐ¸Ðµ Ð´ÐµÐ½ÑŒÐ³Ð¸. Ð¥Ð¾Ñ‚Ñ�, ÐºÐ°Ð¶Ð´Ñ‹Ð¹ Ð¸Ð³Ñ€Ð¾Ðº Ð¼Ð¾Ð¼ÐµÐ½Ñ‚Ð°Ð»ÑŒÐ½Ð¾ Ñ€Ð°Ð·Ð±ÐµÑ€ÐµÑ‚Ñ�Ñ� Ñ� ÐºÐ°Ñ‚Ð°Ð»Ð¾Ð³Ð¾Ð¼ Ð¸Ð³Ñ€. Ð¡Ñ€ÐµÐ´Ð¸ Ð¿Ð¾Ð¿ÑƒÐ»Ñ�Ñ€Ð½Ñ‹Ñ... Ð°Ð²Ñ‚Ð¾Ð¼Ð°Ñ‚Ð¾Ð² ÐµÑ�Ñ‚ÑŒ Ñ€Ð°Ð·Ñ€Ð°Ð±Ð¾Ñ‚ÐºÐ¸ Ð¾Ñ‚ Novomatic, IgroSoft, Microgaming Ð¸ Ð´Ñ€ÑƒÐ³Ð¸Ðµ. Ð"ÐµÐ¼Ð±Ð»Ð¸Ð½Ð³ Ð² Ð²Ð¸Ñ€Ñ‚ÑƒÐ°Ð»ÑŒÐ½Ð¾Ð¹ Ñ€ÐµÐ°Ð»ÑŒÐ½Ð¾Ñ�Ñ‚Ð¸: Ð¾Ð½Ð»Ð°Ð¹Ð½-ÐºÐ°Ð·Ð¸Ð½Ð¾ Ð±ÑƒÐ´ÑƒÑ‰ÐµÐ³Ð¾.Ð¡Ð°Ð¼Ð¾Ð¸Ñ�ÐºÐ»ÑŽÑ‡ÐµÐ½Ð¸Ðµ Ð² ÐºÐ°Ð·Ð¸Ð½Ð¾ - Ð´Ð»Ñ� Ñ‡ÐµÐ³Ð¾ Ð¾Ð½Ð¾ Ñ�ÑƒÑ‰ÐµÑ�Ñ‚Ð²ÑƒÐµÑ‚.ÐœÑ‹ Ð³Ð¾Ñ‚Ð¾Ð²Ð¸Ð¼ Ð´Ð»Ñ� Ð²Ð°Ñ� Ñ�ÑŽÑ€Ð¿Ñ€Ð¸Ð·Ñ‹ ÐµÐ¶ÐµÐ¼ÐµÑ�Ñ�Ñ‡Ð½Ð¾.Ð£ Ð½Ð°Ñ� Ð²Ñ‹ Ð²Ñ�Ñ‚Ñ€ÐµÑ‚Ð¸Ñ‚Ðµ Ð¿Ð¾Ð»Ð¾Ð½ Ñ€Ð¾Ñ‚ Ð¸Ð·Ð²ÐµÑ�Ñ‚Ð½Ñ‹Ñ... Ð¿ÐµÑ€Ñ�Ð¾Ð½Ð°Ð¶ÐµÐ¹ Ñ‚Ð¾Ñ€Ñ‡ÐºÐ¾Ð¼ Ð¸Ð· Ð¼Ð¸Ñ€Ð¾Ð² Ð˜Ñ�Ñ‚Ð¾Ñ€Ð¸Ð¸, ÐšÑƒÐ»ÑŒÑ‚ÑƒÑ€Ñ‹ Ð¸ ÐŸÑ€Ð¸Ñ€Ð¾Ð´Ñ‹.Ð*Ñ�Ð»Ð¸ Ñƒ Ð²Ð°Ñ� ÐºÐ¾Ð½Ñ‡ÐµÐ½ Ð±Ð°Ð» Ð´ÐµÐ½ÐµÐ³ Ð²Ñ�ÐµÐ³Ð¾ Ð´Ð»Ñ� Ñ‚Ð¾Ð³Ð¾, Ñ� Ð½Ð°Ð¼ÐµÑ€ÐµÐ½Ð¸ÐµÐ¼ Ñ�Ð¾Ð²ÐµÑ€ÑˆÐ¸Ñ‚ÑŒ 100 Ñ�Ð¿Ð¸Ð½Ð¾Ð², Ð²Ñ‹ Ð½Ðµ Ñ�Ð¼Ð¾Ð¶ÐµÑ‚Ðµ Ð¿Ð¾Ð±ÐµÐ´Ð¸Ñ‚ÑŒ.Ð¢Ð°Ðº ÐºÐ°Ðº Ð»ÑŽÐ±Ð°Ñ� Ñ�Ð»Ð¾Ñ‚-Ñ�Ð½Ð°Ñ€Ñ�Ð´ Ð¸Ñ�Ð¿Ð¾Ð»ÑŒÐ·ÑƒÐµÑ‚ Ð³ÐµÐ½ÐµÑ€Ð°Ñ‚Ð¾Ñ€ Ñ�Ð»ÑƒÑ‡Ð°Ð¹Ð½Ñ‹Ñ... Ñ‡Ð¸Ñ�ÐµÐ», Ð´Ð°Ð±Ñ‹ Ð¾Ð¿Ñ€ÐµÐ´ÐµÐ»Ð¸Ñ‚ÑŒ, ÐºÐ°ÐºÐ¸Ðµ Ð²Ñ‹Ð¸Ð³Ñ€Ñ‹ÑˆÐ¸ Ð±ÑƒÐ´ÑƒÑ‚ Ð²Ñ‹Ð¿Ð»Ð°Ñ‡Ð¸Ð²Ð°Ñ‚ÑŒÑ�Ñ�, Ð½ÐµÐºÐ¾Ñ‚Ð¾Ñ€Ñ‹Ðµ Ð¸Ð³Ñ€Ð¾ÐºÐ¸ Ð¿Ñ€ÐµÐ´Ð¿Ð¾Ñ‡Ð¸Ñ‚Ð°ÑŽÑ‚ Ð¿ÐµÑ€ÐµÐ·Ð°Ð³Ñ€ÑƒÐ·Ð¸Ñ‚ÑŒ Ð°Ð²Ñ‚Ð¾Ð¼Ð°Ñ‚ - Ð¸ ÐµÑ‰Ðµ Ñ€Ð°Ð· Ð·Ð°Ð±Ð»ÑƒÐ¶Ð´Ð°ÑŽÑ‚Ñ�Ñ�.ÐŸÐ¾ ÑƒÐºÐ°Ð·Ð°Ð½Ð½Ð¾Ð¼Ñƒ Ð°Ð´Ñ€ÐµÑ�Ñƒ Ñ€Ð°Ñ�Ð¿Ð¾Ð»Ð¾Ð¶ÐµÐ½Ð° Ð±ÑƒÐºÐ¼ÐµÐºÐµÑ€Ñ�ÐºÐ°Ñ� ÐºÐ¾Ð½Ñ‚Ð¾Ñ€Ð° Â«Ð¤Ð¾Ð½Ð±ÐµÑ‚.Ð¢ÑƒÑ‚ Ñ†ÐµÐ»Ð¾Ðµ Ð³Ñ€Ð°Ð¼Ð¾Ñ‚ÐºÐ° Ñ�Ð¾ Ñ�Ð»ÐµÐ·Ð°Ð¼Ð¸ Ð¸ Ñ� Ð¼Ð¾Ð»ÑŒÐ±Ð°Ð¼Ð¸Â», -- Ð¾Ñ‚Ð¼ÐµÑ‚Ð¸Ð» Ð´ÐµÐ¿ÑƒÑ‚Ð°Ñ‚.Finn and the Swirly Spin / Ð¤Ð¸Ð½ Ð¸ Ñ�Ð¿Ð¸Ñ€Ð°Ð»ÑŒÐ½Ñ‹Ðµ Ð²Ñ€Ð°Ñ‰ÐµÐ½Ð¸Ñ�.Pink Elephants / Ð Ð¾Ð·Ð¾Ð²Ñ‹Ðµ Ð¡Ð»Ð¾Ð½Ñ‹.Ð­Ñ‚Ð¾ Ð·Ð½Ð°Ñ‡Ð¸Ñ‚, Ñ‡Ñ‚Ð¾ Ð¾Ñ‚ Ð¿Ð¾-Ð½Ð°Ñ�Ñ‚Ð¾Ñ�Ñ‰ÐµÐ¼Ñƒ ÐºÑ€ÑƒÐ¿Ð½Ð¾Ð³Ð¾ Ð²Ñ‹Ð¸Ð³Ñ€Ñ‹ÑˆÐ° Ð²Ð°Ñ� Ð¾Ñ‚Ð´ÐµÐ»Ñ�ÐµÑ‚ Ð²Ñ�ÐµÐ³Ð¾ Ð¾Ð´Ð½Ð° Ñ�Ñ‚Ð°Ð²ÐºÐ°.Ð˜ Ñ�Ñ‚Ñƒ Ñ�Ñ‚Ð°Ð²ÐºÑƒ Ð² ÐºÐ°Ð·Ð¸Ð½Ð¾ Ð'ÑƒÐ»ÐºÐ°Ð½ Ð¸Ð³Ñ€Ð¾Ð²Ñ‹Ðµ Ð°Ð²Ñ‚Ð¾Ð¼Ð°Ñ‚Ñ‹ Ð¿Ð¾Ð·Ð²Ð¾Ð»Ñ�ÑŽÑ‚ Ñ�Ð´ÐµÐ»Ð°Ñ‚ÑŒ Ð¼Ð³Ð½Ð¾Ð²ÐµÐ½Ð½Ð¾ Ð¸ Ð»ÐµÐ³ÐºÐ¾.Ð'Ñ�ÐµÐ³Ð¾ Ð·Ð°Â Ð¼Ð¾Ð½ÐµÑ‚ÐºÑƒ Ð¾Ð½Ð¸ Ð¸Ð³Ñ€Ð°Ð»Ð¸ Ñ�Â Ð½Ð°Ð¼Ð¸Ñ€Ð°Ð·Ð²Ð¸Ð²Ð°Ð»Ð¸ Ð½Ð°ÑˆÑƒ Ð»Ð¾Ð²ÐºÐ¾Ñ�Ñ‚ÑŒ Ñ‚ÐµÑˆÐ¸Ð»Ð¸ Ð½Ð°Ð´ÐµÐ¶Ð´Ð°Ð¼Ð¸ Ð½Ð°Â Ð±Ð°Ñ�Ð½Ð¾Ñ�Ð»Ð¾Ð²Ð½Ñ‹Ð¹ Ð²Ñ‹Ð¸Ð³Ñ€Ñ‹Ñˆ.Ð"Ñ€Ð¾Ð¼Ð¾Ð·Ð´ÐºÐ¸Ðµ Ð¿Ñ€Ð¸Ð¼Ð¸Ñ‚Ð¸Ð²Ð½Ñ‹Ðµ Ð½Ð°Â Ð½Ñ‹Ð½ÐµÑˆÐ½Ð¸Ð¹ Ð»Ð¸Ñ†ÐµÐ·Ñ€ÐµÐ½Ð¸Ðµ Ð¾Ð½Ð¸ Ð¿Ð¾Ð´Ð°Ñ€Ð¸Ð»Ð¸ Ñ‡ÐµÐ»Ð¾Ð²ÐµÑ‡ÐµÑ�Ñ‚Ð²Ñƒ Ð²Ð¸Ñ€Ñ‚ÑƒÐ°Ð»ÑŒÐ½ÑƒÑŽ Ñ€ÐµÐ°Ð»ÑŒÐ½Ð¾Ñ�Ñ‚ÑŒ ÐµÑ‰Ðµ Ð´Ð¾Â Ñ‚Ð¾Ð³Ð¾ ÐºÐ°Ðº Ð²Ð¾Ð·Ð½Ð¸ÐºÐ»Ð¾ Ñ�Ñ‚Ð¾ Ð¿Ð¾Ð½Ñ�Ñ‚Ð¸Ðµ.Ð˜ Ð´Ð°, Ð±Ð¾Ð»ÑŒÑˆÐ°Ñ� Ñ‡Ð°Ñ�Ñ‚ÑŒ Ð¸Ð³Ñ€Ð°ÑŽÑ‰Ð¸Ñ... Ð·Ð´ÐµÑ�ÑŒ - Ð¿Ð°Ñ€Ð½Ð¸.Ð�Ð¾ Ð±Ð°Ñ�Ñ‚Ð° Ð·Ð°Ñ‡Ð°Ñ�Ñ‚ÑƒÑŽ Ð²Ð¸Ð´ÐµÐ» Ð¸ Ð´ÐµÐ²ÑƒÑˆÐµÐº, Ð±ÐµÑ�Ð¿Ð¾Ñ‰Ð°Ð´Ð½Ð¾ Ð¼Ð¾Ñ‡Ð°Ñ‰Ð¸Ñ... Ñ�Ð²Ð¾Ð¸Ñ... Ð²Ð¸Ñ€Ñ‚ÑƒÐ°Ð»ÑŒÐ½Ñ‹Ñ... Ð¾Ð¿Ð¿Ð¾Ð½ÐµÐ½Ñ‚Ð¾Ð² Ð² ÐºÐ°ÐºÐ¾Ð¹-Ð½Ð¸Ð±ÑƒÐ´ÑŒ King Of Fighters. <a href=https://vk.com/casinororg>Ð˜Ð³Ñ€Ð°Ñ‚ÑŒ Ð² Ñ�Ð°Ð¼Ñ‹Ðµ Ð¿Ð¾Ð¿ÑƒÐ»Ñ�Ñ€Ð½Ñ‹Ðµ Ð²Ð¸Ñ€Ñ‚ÑƒÐ°Ð»ÑŒÐ½Ñ‹Ðµ casino</a> Ð²Ñ‹ Ð¼Ð¾Ð¶ÐµÑ‚Ðµ ÐºÐ°Ðº Ð² Ð´ÐµÐ¼Ð¾ Ð²ÐµÑ€Ñ�Ð¸Ð¸, Ñ‚Ð°Ðº Ð¸ Ð½Ð° Ñ€ÐµÐ°Ð»ÑŒÐ½Ñ‹Ðµ Ð´ÐµÐ½ÐµÐ¶Ð½Ñ‹Ðµ Ñ�Ñ€ÐµÐ´Ñ�Ñ‚Ð²Ð°. Ð�ÑƒÐ¶Ð½Ð¾ Ð²Ñ‹Ð´ÐµÐ»Ð¸Ñ‚ÑŒ Ð¸Ð³Ñ€Ñƒ Ð² Ð¾Ð½Ð»Ð°Ð¹Ð½ ÐºÐ°Ð·Ð¸Ð½Ð¾ Ð½Ð° Ð´ÐµÐ½ÑŒÐ³Ð¸, Ð³Ð´Ðµ Ð²Ñ‹ Ð¼Ð¾Ð¶ÐµÑ‚Ðµ Ð¿Ð¾Ð»ÑƒÑ‡Ð°Ñ‚ÑŒ Ð¾Ñ‚Ð»Ð¸Ñ‡Ð½Ñ‹Ðµ Ð±Ð¾Ð½ÑƒÑ�Ñ‹. ÐœÐ½Ð¾Ð¶ÐµÑ�Ñ‚Ð²Ð¾ online casino, ÐºÐ¾Ñ‚Ð¾Ñ€Ñ‹Ðµ Ð²ÐµÐ´ÑƒÑ‚ Ñ�ÐµÐ±Ñ� Ñ‡ÐµÑ�Ñ‚Ð½Ð¾, Ð¿Ñ€ÐµÐ´Ð¾Ñ�Ñ‚Ð°Ð²Ð»Ñ�ÑŽÑ‚ Ð±ÐµÐ·Ð´ÐµÐ¿Ð¾Ð·Ð¸Ñ‚Ð½Ñ‹Ðµ Ð±Ð¾Ð½ÑƒÑ�Ñ‹. Ð£ Ñ€Ð°Ð·Ð½Ñ‹Ñ... Ð¿Ð»Ð°Ñ‚Ñ„Ð¾Ñ€Ð¼ Ñ€ÐµÐ¿ÑƒÑ‚Ð°Ñ†Ð¸Ñ� Ð¾Ñ†ÐµÐ½Ð¸Ð²Ð°ÐµÑ‚Ñ�Ñ� Ð¸Ð³Ñ€Ð¾ÐºÐ°Ð¼Ð¸, ÐºÐ¾Ñ‚Ð¾Ñ€Ñ‹Ðµ Ñ‚Ð°Ð¼ Ð¸Ð³Ñ€Ð°ÑŽÑ‚. Ð*Ñ�Ð»Ð¸ Ð¸Ð³Ñ€Ð¾ÐºÐ¸ Ñ� Ð¸Ð¼ÐµÐ½ÐµÐ¼ Ð¸Ð³Ñ€Ð°ÑŽÑ‚ Ð½Ð° Ð¾Ñ„Ð¸Ð³ÐµÐ½Ð½Ñ‹Ñ... Ð¿Ð¾Ñ€Ñ‚Ð°Ð»Ð°Ñ..., Ñ‚Ð°ÐºÐ¸Ðµ casino Ð¾Ð±Ð»Ð°Ð´Ð°ÑŽÑ‚ Ð»Ð¸Ñ†ÐµÐ½Ð·Ð¸ÐµÐ¹. Ð' Ð¾Ñ�Ð½Ð¾Ð²Ð½Ð¾Ð¼, Ñ‚Ð°Ð¼ Ñ€ÐµÐ°Ð»ÑŒÐ½Ð¾ <a href=https://www.facebook.com/groups/casinor.net/>Ð¸Ð³Ñ€Ð°Ñ‚ÑŒ Ð² Ð¸Ð³Ñ€Ð¾Ð²Ñ‹Ðµ Ð°Ð²Ñ‚Ð¾Ð¼Ð°Ñ‚Ñ‹ Ð½Ð° Ñ€ÑƒÐ±Ð»Ð¸</a>. Ð*Ñ�Ð»Ð¸ Ð²Ñ‹ Ð¶ÐµÐ»Ð°ÐµÑ‚Ðµ Ð½Ð° Ñ€ÐµÐ³ÑƒÐ»Ñ�Ñ€Ð½Ð¾Ð¹ Ð¾Ñ�Ð½Ð¾Ð²Ðµ Ð²Ñ‹Ð¸Ð³Ñ€Ñ‹Ð²Ð°Ñ‚ÑŒ Ð±Ð¾Ð»ÑŒÑˆÐ¸Ðµ Ð´ÐµÐ½ÑŒÐ³Ð¸, Ð²Ð°Ð¼ Ð½ÑƒÐ¶ÐµÐ½ Ð¿Ð¾Ñ�Ñ‚Ð¾Ñ�Ð½Ð½Ñ‹Ð¹ Ð´Ð¾Ñ...Ð¾Ð´. ÐŸÐµÑ€Ð²Ð¾Ðµ Ð²Ñ€ÐµÐ¼Ñ� Ð½Ðµ Ð²Ñ‹Ð¹Ð´ÐµÑ‚ Ð²Ñ‹Ð¸Ð³Ñ€Ñ‹Ð²Ð°Ñ‚ÑŒ Ð±Ð¾Ð»ÑŒÑˆÐ¸Ðµ Ð´ÐµÐ½ÑŒÐ³Ð¸. Ð�Ð¾, ÐºÐ°Ð¶Ð´Ñ‹Ð¹ Ð¿Ð¾Ñ�ÐµÑ‚Ð¸Ñ‚ÐµÐ»ÑŒ Ð² Ñ�Ð¶Ð°Ñ‚Ñ‹Ðµ Ñ�Ñ€Ð¾ÐºÐ¸ Ñ€Ð°Ð·Ð±ÐµÑ€ÐµÑ‚Ñ�Ñ� Ñ� ÐºÐ°Ñ‚Ð°Ð»Ð¾Ð³Ð¾Ð¼ Ð¸Ð³Ñ€. Ð¡Ñ€ÐµÐ´Ð¸ Ð¸Ð·Ð²ÐµÑ�Ñ‚Ð½Ñ‹Ñ... Ð°Ð²Ñ‚Ð¾Ð¼Ð°Ñ‚Ð¾Ð² ÐµÑ�Ñ‚ÑŒ Ð¸Ð³Ñ€Ñ‹ Ð¾Ñ‚ Novomatic, IgroSoft, Microgaming Ð¸ Ð´Ñ€ÑƒÐ³Ð¸Ðµ. Ð' 2005 Ð³Ð¾Ð´Ñƒ Ð¿Ñ€Ð°Ð²Ð¸Ñ‚ÐµÐ»ÑŒÑ�Ñ‚Ð²ÐµÐ½Ð½Ñ‹Ð¹ Ð¾Ð±Ð¾Ñ€Ð¾Ñ‚ Ñ�Ñ‚Ð¾Ð¹ Ñ�Ñ„ÐµÑ€Ñ‹ Ñ�Ð¾Ñ�Ñ‚Ð°Ð²Ð»Ñ�Ð» ÑˆÐµÑ�Ñ‚ÑŒ Ð¼Ð¸Ð»Ð»Ð¸Ð°Ñ€Ð´Ð¾Ð² Ð´Ð¾Ð»Ð»Ð°Ñ€Ð¾Ð².Ð Ð¾Ñ�Ñ�Ð¸ÑŽ Ð¾Ñ...Ð²Ð°Ñ‚Ð¸Ð»Ð° Ð¸Ð³Ñ€Ð¾Ð²Ð°Ñ� Ð»Ð¸Ñ...Ð¾Ñ€Ð°Ð´ÐºÐ°.Ð�Ð"ÐœÐ˜Ð�Ð˜Ð¡Ð¢Ð Ð˜Ð ÐžÐ'Ð�Ð�Ð˜Ð* Ð¡Ð�Ð™Ð¢Ð� ÐžÐ¡Ð£Ð©Ð*Ð¡Ð¢Ð'Ð›Ð¯Ð*Ð¢ Ð�Ð�Ðž "Ð¡ÐšÐ£ÐšÐ˜.Ð�Ð*Ð¢" Ð' Ð Ð�ÐœÐšÐ�Ð¥ Ð¡ÐžÐ¦Ð˜Ð�Ð›Ð¬Ð�ÐžÐ"Ðž ÐŸÐ ÐžÐ*ÐšÐ¢Ð� "SKUKI.Ð�Ð° Ð½ÐµÐ³Ð¾ Ð¿Ñ€Ð¸Ñ�Ñ‚Ð½Ð¾ Ð´Ð°Ð¶Ðµ Ð¿Ñ€Ð¾Ñ�Ñ‚Ð¾ Ñ‚Ð°Ñ€Ð°Ñ‰Ð¸Ñ‚ÑŒ Ð³Ð»Ð°Ð·Ð°.Ð' Ñ‚Ð¾Ð¹ Ð¶Ðµ Ð¼ÐµÑ€Ðµ Ñ�Ñ‚Ð¾ Ð¾Ñ‚Ð½Ð¾Ñ�Ð¸Ñ‚Ñ�Ñ� Ð¸ Ðº Ñ�Ð»Ð¾Ñ‚Ñƒ Alchemist's Lab Ñ‚Ð¾Ð³Ð¾ Ð¶Ðµ Ð²ÐµÐ½Ð´Ð¾Ñ€Ð°.Ð­Ñ‚Ð¾ Ð½Ðµ Ð´Ð¾Ð·Ð²Ð¾Ð»Ñ�ÐµÑ‚Ñ�Ñ� Ñ‚Ñ€Ð°ÐºÑ‚Ð¾Ð²Ð°Ñ‚ÑŒ, ÐºÐ°Ðº Ð½ÐµÐ¿Ñ€Ð°Ð²Ð¸Ð»ÑŒÐ½Ð¾Ñ�Ñ‚ÑŒ Ð¸Ð»Ð¸ ÐºÐ°Ñ‡ÐµÑ�Ñ‚Ð²Ð¾ Ñ�Ð»Ð¾Ñ‚-Ð°Ð²Ñ‚Ð¾Ð¼Ð°Ñ‚Ð° -- Ð¾Ñ‚Ð½Ð¾Ñ�Ð¸Ñ‚Ðµ Ð¾Ð¿Ñ†Ð¸ÑŽ Ðº Ð¾Ñ�Ð¾Ð±ÐµÐ½Ð½Ð¾Ñ�Ñ‚Ñ�Ð¼ Â«Ð¾Ð´Ð½Ð¾Ñ€ÑƒÐºÐ¾Ð³Ð¾ Ð±Ð°Ð½Ð´Ð¸Ñ‚Ð°Â» Ð½Ð° Ð¼Ð¾Ð½ÐµÑ‚Ð°.Ð�ÐµÐºÐ¾Ð³Ð´Ð° Ñ‡ÐµÐ¼ Ð² Ð°Ð²Ñ‚Ð¾Ð¼Ð°Ñ‚Ñ‹ Ð·Ð°Ð±Ð°Ð²Ð»Ñ�Ñ‚ÑŒÑ�Ñ� Ð½Ð° Ð·ÐµÑ€ÐºÐ°Ð»Ðµ Ð¾Ð½Ð»Ð°Ð¹Ð½ ÐºÐ°Ð·Ð¸Ð½Ð¾ Ð¸Ð»Ð¸ Ð½Ð° ÐµÐ³Ð¾ Ð¾Ñ„Ð¸Ñ†Ð¸Ð°Ð»ÑŒÐ½Ð¾Ð¼ Ñ�Ð°Ð¹Ñ‚Ðµ, Ð¸Ð·ÑƒÑ‡Ð¸Ñ‚Ðµ Ð¿Ñ€Ð°Ð²Ð¸Ð»Ð° Ð¸Ð³Ñ€Ñ‹.Ð¡Ð¾Ð³Ð»Ð°Ñ�ÐµÐ½ Ñ� Ð¾Ð±Ñ€Ð°Ð±Ð¾Ñ‚ÐºÐ¾Ð¹ Ð¼Ð¾Ð¸Ñ... Ð¿ÐµÑ€Ñ�Ð¾Ð½Ð°Ð»ÑŒÐ½Ñ‹Ñ... Ð´Ð°Ð½Ð½Ñ‹Ñ... Ð² Ñ�Ð¾Ð¾Ñ‚Ð²ÐµÑ‚Ñ�Ñ‚Ð²Ð¸Ð¸ Ñ�Ð¿Ð¾Ð»Ð¸Ñ‚Ð¸ÐºÐ¾Ð¹ ÐºÐ¾Ð½Ñ„Ð¸Ð´ÐµÐ½Ñ†Ð¸Ð°Ð»ÑŒÐ½Ð¾Ñ�Ñ‚Ð¸.ÐžÐ±ÑŠÐµÐ¼Ð¸Ñ�Ñ‚Ñ‹Ð¹ Ð±Ð°Ð½ÐºÐµÑ‚Ð½Ñ‹Ð¹ Ð·Ð°Ð» (Ð¾Ñ‚ 50 Ð´Ð¾ 350 Ñ‡ÐµÐ».Ð˜Ð³Ñ€Ð¾Ðº Ð¾Ð¿ÑƒÑ�ÐºÐ°Ð» Ð¼Ð¾Ð½ÐµÑ‚ÐºÑƒ Ð²Â Ñ‰ÐµÐ»ÑŒ Ð¸Â Ð¿Ð¾Ð»ÑƒÑ‡Ð°Ð» Ð½Ðµ Ð³Ñ€ÐµÑ... Ñ�Â Ð¿Ð¾Ð¼Ð¾Ñ‰ÑŒÑŽ Ñ€Ñ‹Ñ‡Ð°Ð³Ð° ÐºÑ€ÑƒÑ‚Ð°Ð½ÑƒÑ‚ÑŒ Ð²Ñ�Ðµ Ð±Ð°Ñ€Ð°Ð±Ð°Ð½Ñ‹ Ð·Ð°Ñ€Ð°Ð·.ÐŸÐ¾Ð´Ñ€Ñ�Ð´ Ð¾Ñ�Ñ‚Ð°Ð½Ð°Ð²Ð»Ð¸Ð²Ð°Ñ�Ñ�ÑŒ, Ð±Ð°Ñ€Ð°Ð±Ð°Ð½Ñ‹ Ñ„Ð¾Ñ€Ð¼Ð¸Ñ€Ð¾Ð²Ð°Ð»Ð¸ Ñ€Ñ�Ð´ Ð¸Ð·Â Ð¿Ñ�Ñ‚Ð¸ ÐºÐ°Ñ€Ñ‚, Ð²Ñ‹Ñ�Ñ‚Ñ€Ð¾ÐµÐ½Ð½Ñ‹Ñ... Ð²Ð´Ð¾Ð»ÑŒ Ð³Ð¾Ñ€Ð¸Ð·Ð¾Ð½Ñ‚Ð°Ð»ÑŒÐ½Ð¾Ð¹ (Â«Ð¿Ð»Ð°Ñ‚ÐµÐ¶Ð½Ð¾Ð¹Â») Ð»Ð¸Ð½Ð¸Ð¸.ÐŸÐ¾Ð»Ð¸Ñ†ÐµÐ¹Ñ�ÐºÐ¸Ðµ Ð¾Ð±Ð½Ð°Ñ€ÑƒÐ¶Ð¸Ð»Ð¸ Ð² Ð¡Ð¾Ð²ÐµÑ‚Ñ�ÐºÐµ Ð¸Ð³Ñ€Ð¾Ð²Ð¾Ð¹ Ð·Ð°Ð».Ð£Ð¿Ñ€Ð°Ð²Ð»ÐµÐ½Ð¸Ñ� Ð¿Ð¾ Ð±Ð¾Ñ€ÑŒÐ±Ðµ Ñ� Ñ�ÐºÐ¾Ð½Ð¾Ð¼Ð¸Ñ‡ÐµÑ�ÐºÐ¸Ð¼Ð¸ Ð¿Ñ€ÐµÑ�Ñ‚ÑƒÐ¿Ð»ÐµÐ½Ð¸Ñ�Ð¼Ð¸ Ñ€ÐµÐ³Ð¸Ð¾Ð½Ð°Ð»ÑŒÐ½Ð¾Ð³Ð¾ Ð£ÐœÐ'Ð" Ð¾Ð±Ð½Ð°Ñ€ÑƒÐ¶Ð¸Ð»Ð¾ Ð² Ð¡Ð¾Ð²ÐµÑ‚Ñ�ÐºÐµ Ð¸Ð³Ñ€Ð¾Ð²Ð¾Ð¹ Ð·Ð°Ð».Ð�ÐµÐ¾Ð±Ñ‹Ñ‡Ð½Ñ‹Ðµ Ð¸Ð´ÐµÐ¸ Ð±Ð¸Ð·Ð½ÐµÑ�Ð° (1000ideas.Ru)Ð¿Ñ€ÐµÐ´Ð¿Ñ€Ð¸Ð½Ð¸Ð¼Ð°Ñ‚ÐµÐ»ÐµÐ¹ Ñ�Ñ‚Ñ€Ð°Ð½Ñ‹* Ð¿Ð¾ Ð´Ð°Ð½Ð½Ñ‹Ð¼ Google Analytics Ð·Ð° Ð¿Ð¾Ñ�Ð»ÐµÐ´Ð½Ð¸Ðµ 365 Ð´Ð½ÐµÐ¹.